It's time to bring this live text to an end but if you're after more football...we have it on the BBC Sport website. Arsenal will go top of the table if they win at Southampton in the late game. The match is still in its early stages and it is currently goalless. Thanks for your company. Everton manager Roberto Martinez to Match of the Day: "Tom Cleverley is an incredible example of a player in the way he behaves and approaches the game. He feels wanted and feels the warmth of the fans." Newcastle boss Steve McClaren to Match of the Day: "The last header of the game. I’m more disappointed for that set of players because they gave everything. You talk about 100% – they gave that. "They didn’t deserve to lose. It's a cruel way to do it. All we can do is pick ourselves up. The crowd were magnificent and appreciated that the players gave everything. "I thought there was some great defending and Robbie Elliot was great in goal. Some of our attacking play second half - if we’d have scored first we’d probably have won. "They’re down. They gave so much. That has to be appreciated. I told them I see a team in there. We’ll win games and get lucky sometimes. If we carry on like that we’ll have a stronger second half." Everton boss Roberto Martinez to Match of the Day: "I think the manner we performed was pleasing. We knew Newcastle had been consistent in the last few games. We had a complete performance and created a huge number of good opportunities. To get it with the last kick of the game it feels good emotionally. I thought some of the play was magnificent at times. This is a real kick-start in our season." Everton host Stoke City on Monday before entertaining Tottenham on 3 January. Then Roberto Martinez's side are at Manchester City on 13 January and Chelsea on 16 January. Newcastle midfielder Jack Colback: "It’s a tough one to take. A bitter pill to swallow. That’s football I suppose. They caused us problems. They're a really good team, they move you into positions you don’t want to go to. But we grew into it and came out better in the second half. I'd say a draw would have been fair. "It's not been a great year but things have been picking up." It doesn't get any easier for Newcastle. After Monday's game at West Bromwich Albion, the Magpies visit Arsenal on 2 January before hosting Manchester United on 12 January. Everton have lost just four times in the Premier League this season. They have their fewest away defeats (1) between the start of season and new year since 1908. Everton midfielder Gareth Barry: "It was a fantastic time for Tom to get his first goal. There's no better feeling than a last minute winner. "It was the sort of game we've been having - dominating and creating and not putting the chances away. Hopefully that can be a turning point." 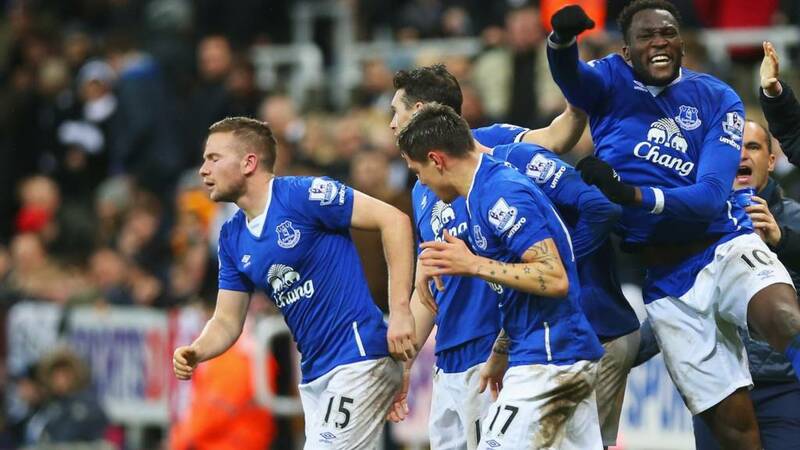 Everton's first win in five Premier League games lifts them up to ninth in the table. For Newcastle it's another sorry sob story. Steve McClaren's side are third from bottom in the table. Winter break? No thanks. Not when you have drama like that. "Newcastle feel like they have been mugged, they had the better opportunities in the second half. Elliot has been outstanding in the second half, but his punch wasn't too clever. "This should have been a draw, Newcastle are really unlucky but well done to Everton, who stuck at it and won the game." Astonishing scenes. Having missed a hatful of chances, Everton grab victory right at the death as Tom Cleverley's looping header from a corner wins it for the Toffees. There's hardly any time for Newcastle to respond and the hosts look shell-shocked at the final whistle. Everton players celebrate as though they have won the FA Cup! Pure drama. Pinball in Everton's penalty area. Frantic defending. "In so many games in the Premier League this year, they'd sit back and settle for a point, but these two are going for it." Can French midifelder Florian Thauvin make a difference for Newcastle? He's on for Ayoze Perez. Newcastle and Everton look as though they could play until midnight...and still wouldn't score. Here comes a late change for the hosts. Kevin Mirallas' game is over. Everton's last change sees him makesway for midfielder Leon Osman. One point will be enough to lift Newcastle out of the bottom three. Six minutes of normal time remaining and here comes another Everton change. Everton have had 16 shots...make that 17 as defender Seamus Coleman tries his luck but can't keep it on target. "A free header, and a very, very good save from Elliot but there was nobody on the back post from Newcastle. You look at the defending now, you don't get centre-backs picking up centre backs, it's a strange thing." Rob Elliot has been terrific and the Newcastle keeper produces another excellent stop to keep out Ramiro Funes Mori's header. Romelu Lukaku can only shoot over the crossbar on the rebound. "It looks like a better save than it is, because it was straight at Howard and he pats it away, but that was a great chance for Newcastle. "Good game now, a proper Boxing Day game when people want to get out of the house and be entertained." Another Newcastle chance and a first serious save by Tim Howard who keeps out Georginio Wijnaldum's close range header. Terrific reactions from the keeper. "How did he miss? Great run from Sissoko, a measured cross and how on Earth did he not hit the target?" What a miss! Newcastle have spent the majority of the game on the back foot but Aleksandar Mitrovic is presented with a golden chance to put the Magpies ahead but heads wide after Moussa Sissoko's excellent cross. "I wonder if Barkley has been taken off with a view to all their games coming up?" Everton midfielder Muhamed Besic is on for his first taste of action since September while winger Gerard Deulofeu is also coming on as the Toffees hunt the goal that will earn them three points. Ross Barkley and Aaron Lennon are the pair to make way. Ross Barkley lets fly from just inside the area...it's heading for the bottom corner until it deflects off a black and white shirt. Double change coming up for Everton. This from Everton is at least giving Dagenham (bottom of football league) the hope that it won't be too much of a hammering in the FA cup in 2 weeks. "There could have been a card for Stones earlier, that was an accumulation for the team. Barkley needs to shut up, he's getting a bit lippy." Trouble for Ross Barkley who picks up the third yellow card of the game for a sliding challenge on Georginio Wijnaldum. There's one game in the Championship taking place at the moment, with Wolves leading Reading after 63 minutes, James Henry with the goal. "Rob Elliot could start for Ireland at the Euros." This is bubbling nicely. Yet another save from Rob Elliot to deny Aaron Lennon. Newcastle fans are angry after John Stones' challenge from behind on Ayoze Perez is ignored by Lee Mason. Rob Elliot's legs are keeping Newcastle in this. This time the Magpies keeper sticks out his left foot to deny Romelu Lukaku a certain goal. Off the pitch Roberto Martinez is wearing a snazzy new coat. A Christmas Day gift? On the pitch...there's not a lot happening. "It's better from Newcastle. This game is starting to open up." Get involved on Twitter using #bbcfootball, or text us on 81111 from the UK only and include your name. Everton have come flying out of the blocks. The ball fizzes across Newcastle six-yard area but a blue shirt is unable to divert it over the line. Back under way at St James' Park where it has stopped raining. Steve McClaren spent part of the first half on the sidelines in a suit getting wet. He didn't have an umbrella! Frustrating from Evertonians point of view. Assume we will dominate possession and score goals...but forget we have a wonderful charitable defense that allows the opposition to have their goals too. Toffee forever. C'mon now. A nice moment at St James' Park. The Toon Army are out of their seats singing a tribute to their former keeper Pavel Srnicek who is in hospital after suffering cardiac arrest. His family are recording the tribute and plan to play it back to him in hospital. "Romelu Lukaku had the best chance of the game as Everton settled well and very quickly, but since then Newcastle have got back into it. "The Toffees have been better than their hosts, but they're just struggling to score at the moment." Neither team can be accused of lacking effort but quality is in short supply in front of goal in a game which faces being last on Match Of The Day unless it there is a marked improvement. Andrew: I've been watching this from Everton all season. Dominate the first half with a nice passing game, opposition gets a half-time team-talk to press more, Everton's game falls apart with no plan B, game ends in a draw. Ross Barkley, who is in full flight, is hauled down by Daryl Janmaat deep inside the Newcastle half. Janmaat has already been booked but Lee Mason keeps his cards in his pocket this time. He's clearly in a charitable mood. The free-kick is a total waste. "Newcastle have pushed on. They were really on the ropes but they're making it much harder for Everton to play it out from the back now and are looking a lot more compact." Strange game. Everton dominated the first 20-odd minutes without scoring and now Newcastle are ending the half on top. Terrible challenge by Gareth Barry on Ayoze Perez. That's 109 cautions for the former Aston Villa and Manchester City man in the Premier League. Are Everton going to pay for not taking the lead after all that possession earlier? Another chance for Newcastle but Ayoze Perez just fails to connect with Aleksandar Mitrovic's flick-on. Another header by Aleksandar Mitrovic and it's not a bad effort. Newcastle are coming back into what is turning out to be a decent game. "Everton must have got in down the right wing on at least three occasions already, and each time there's been no pressure. Fortunately for Newcastle, each time they've picked out the wrong cross. "Down the other end Aleksandar Mitrovic went for a glancing header when he really should have launched himself through the ball. Jackie Milburn would have buried it." First signs of a threat from Newcastle...and it's a decent chance. A delicious cross by Daryl Janmaat glances the head of Aleksander Mitrovic and the ball fizzes past Tim Howard's post. Everton have scored at least twice in their last seven league meetings with Newcastle. You wouldn't bet against them doing it again. Just look at how advanced Everton are! Only two outfield players have spent the vast majority of the opening exchanges inside their own half. In contrast, nine of Newcastle's 10 outfield players have been firmly entrenched in their own half. Another chance for Everton and it's Kevin Mirallas again but the Belgian shoots straight at Rob Elliot who makes a comfortable save. More sighs from the home fans. Very little Christmas cheer at St James' Park. More groans after they give away possession...again. In contrast, Everton are giving a masterclass in passing. Ominous signs here for a very poor Newcastle. They can't keep the ball and are giving it away cheaply. Everton will be annoyed they haven't yet taken the lead. "Romelu Lukaku had Fabricio Coloccini on toast there. He just brushed past him so easily. Twenty yards from goal, Tom Cleverley can shoot but doesn't and looks for the pass instead." Romelu Lukaku is warming up nicely. The powerful Everton battering ram has had a couple of powerful runs already at the Magpies defence. First caution of the game and it's Newcastle's Daryl Janmaat who goes into the book after fouling Gareth Barry. It's all Everton. Newcastle just have not got going. Romelu Lukaku goes down inside the area after running into Paul Dummett. Everton's fans roar for a penalty but Lee Mason isn't interested. Kevin Mirallas is making a rare start and the Everton player is denied a goal as Rob Elliot saves with his leg after Seamus Coleman's cross causes havoc in the Newcastle area. Decent start by Everton who are bossing possession in the opening exchanges but it is already evident that the wet conditions are going to have an impact. Players from both sides are already coated in mud. Steve McClaren is late out of the tunnel. The Newcastle boss ha only just taken his seat in the dugout - after going to the opposition bench to shake the hands of every member of Everton's coaching staff. Lukaku to equal 88-year record? Everton get us under way at a very wet St James' Park. Here's an encouraging stat for Everton fans. The last time Everton and Newcastle played on Boxing Day (1986), Everton won 4-0 at St James’ Park. It was arguably the best display of that title-winning season. Paul Power, Adrian Heath and Trevor Steven (2) were the scorers. Umbrella sales have gone through the roof in Newcastle. It's pouring down as kick-off approaches. Lots of Santa hats on display but one chap has turned up in a black and white hard hat. Some say Everton are underachieving in the Premier League. And, in our Predictor league table, the Toffees certainly are. Everton fans are scrapping around in 17th position, while their Newcastle rivals are faring slightly better in 13th. You can help improve your team's form by having your say in our Predictor game. One former Newcastle player in the thoughts of home fans at St James' Park is Pavel Srnicek, who suffered a cardiac arrest in the Czech Republic earlier this week. Fans are being encouraged to sing the former goalkeeper's name at half-time so his family can play a recording back to him as he recovers. Will Romelu Lukaku score in his eighth successive Premier League game? "Just when Newcastle looked to have turned a corner with those impressive wins over Liverpool and Tottenham they come crashing back to reality with last week's draw at home to hapless Aston Villa. "The Toon are still too close to the relegation zone for comfort. In fact the last time they were this low in the table on Christmas Day was in 1988 and they went down that season. "Everton's frustrating form is still too patchy for them to kick on. Far too many draws means they remain cast as mid-table also-rans. "I can't see past a 1-1 scoreline in this one either. With Romelu Lukaku scoring again, naturally." Forwards Ayoze Perez and Aleksandar Mitrovic are recalled to the Newcastle side for the visit of Everton. They replace Siem de Jong and Papiss Cisse, who has a groin injury. Everton make two changes as Kevin Mirallas and Aaron Lennon come in for Arouna Kone and Gerard Deulofeu. Romelu Lukaku, who has nine goals in his last eight games, leads the line for the Toffees. Bad news for Newcastle fans before a ball has even been kicked in anger. Having started the day with a two-point safety cushion, their team is back in the relegation zone after Swansea's win over West Brom. Everton were 10th but have slipped to 11th following the 15:00 GMT games. They started 2015 just seven points off a Champions League spot yet Newcastle United begin their final home game of a sorry calendar year stuck in the relegation zone. Can Steve McClaren's men give the Toon Army hope they can turn around their fortunes in 2016? Or will Romelu Lukaku continue his astonishing goalscoring form for Everton? Welcome to our live page for Newcastle v Everton. We’ll have text commentary here from 17:00 GMT. You can keep up to date with all of today’s games here.